Wow! Amazing job on this one. I once had to index 6MM document and had a goal to make it happen in less than 10 minutes for 14GB of data. While running solr, I saw the same problem and it was the single thing that prevented me from having a single process hit my goal. I'm thrilled to check this out - thanks. That sounds great - in which lucene version was this feature developed? This is in the upcoming Lucene 4.0 .. the alpha release should be out any day now! hi, i wonder if we can configure the number of indexing threads through solr4 ? also would you mind explaining more on how RAM buffer affects the indexing rate? many thanks! 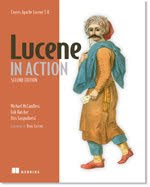 Hi, please ask those questions on the solr-user@lucene.apache.org list. Thanks. do u mean mutipul interWriter write to the same index path concurrently ? Using a thread pool to do indexing is currently not done by IndexWriter, i.e. it's up to the application. But I agree a simple Utility class to do this would be a nice addition to Lucene ... maybe you can open a Jira issue and attach an initial patch? 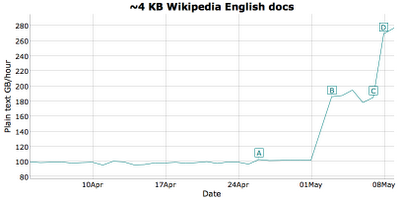 The Lucene docs suggest to re-use IndexWriter instance because it's costly close() operation . i agreed with this , but i'm wondering when should close it properly ? Close it when your application needs to shutdown.